Beef Stroganoff (or Beef Stroganov) is a dish with Russian origins. Pieces of sauteed deef is served in a sour cream sauce. It's origins go all the way back to mid-19th-century Russia, but it has since become popular around the world, with variations from the original recipe. When you are short on time, this pressure cooker version delivers everything you love about a classic beef stroganoff in just over an hour. Tender beef in garlicky cream sauce is served over egg noodles for a perfect hearty weeknight dinner. This dish that is sure to become a family favorite! Mix flour, salt, and pepper in a sealable plastic bag; add beef stew meat, seal bag, and toss to coat beef in flour. Cook beef in hot oil until completely browned, 4 to 5 minutes; add onion and garlic and continue to cook until softened, about 3 minutes. Pour beef broth into the pot. Select Pressure Cook (Manual) and cook for 35 minutes on High pressure. Stir mushrooms, sour cream, mustard, and dill through the beef mixture. Select Pressure Cook (Manual) and cook for 2 minutes on High pressure. While the sauce cooks, bring a large pot of salted water to a boil. Cook egg noodles at a boil until al dente, about 7 minutes; drain. Divide noodles between six plates. Season stroganoff with salt and pepper; ladle over egg noodles to serve. Cremini mushrooms are also known as "baby bella" mushrooms in some grocery stores. Just remember, both crimini mushrooms and portobellos are more intensely flavored than their more widely used cousin, the white button mushroom. Per Serving: 536 calories; 21g fat; 29.4g carbohydrates; 57g protein; 184mg cholesterol; 409mg sodium. 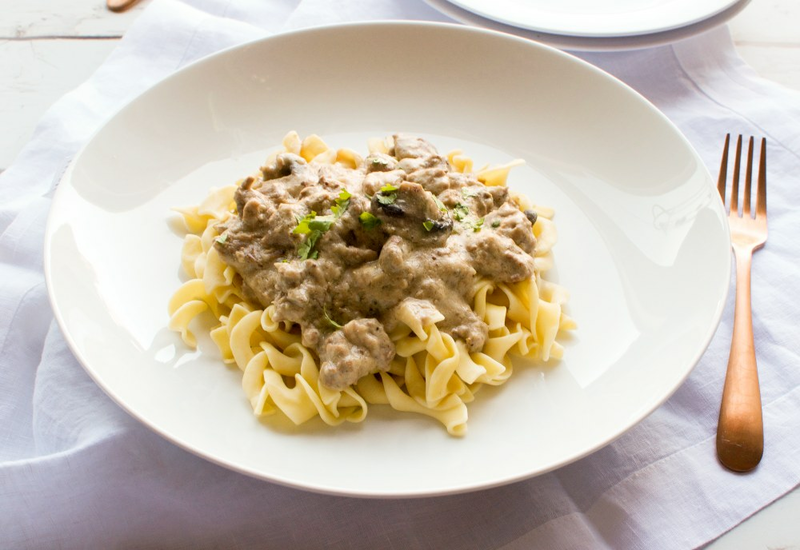 This stroganoff recipe is a family favorite at our house. Whenever I make it there are never any leftovers. The sauce in this dish is by far one of the most flavorful sauces we've prepared. This is definitely our family's go to recipe. Delicious dish, much better than the canned cream of mushroom version I used to make! This is the only way I will ever prepare beef stroganoff now. Using fresh mushrooms really makes a huge difference. This was excellent! The creminis were great in this. The gravy and egg noodles was heavenly. Almost didn't otherwise need the meat. Just wanted piles of noodles, mushrooms, and gravy! Used Mexican-style sour cream because that's what I had. Easy and relatively quick. Thank you multipot! This was a fantastic recipe! Much better than using canned cream of mushroom. This is the real deal. Maybe add a little extra salt or seasoning if you must. I definitely had seconds and thirds. I made the stroganoff meat sauce only and paired it with cauliflower mash instead of noodles, per my husbands request. He loved it! So that’s a win in my book. OMG!!!! Yet another recipe that knocks it out of the park!!! Your test kitchens rule!!! So tasty & had a nice zip with the Dijon which was balanced out by the dill perfectly!!! Definitely going to make this often!!! Made this three times for my family. Making it again tonight. We love it!! Very yummy! Easy to make and my 15 and 8 year old kids love it. So good! Will definitely make again, only challenge was browning the beef and getting worried the pot wouldn’t come to pressure since the bottom of the pot was brown (saw that happen to others in reviews), but it all came together so nicely. Loved the dill addition! Delicious and super Easy! I will def make this again!